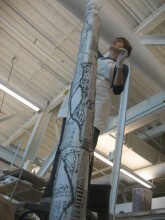 If you’re wondering what I’ve been “up” to in Halifax lately, here’s a recent image of me working in my beautiful studio at NSCAD. My MFA exhibition at the Mary E. Black Gallery will be up exactly three weeks from today on April 11, with the opening reception taking place on April 17 at 6:00 p.m. Previous PostMFA Group ShowNext PostNew Year – New Job! Peter brought me your brochure, devastatus rememorari. I remember a very enjoyable walk through Pleasant Park a few years ago. It is hard to imagine the destruction. Your memorial made me feel very sad. As the daughter of a forester, I am always sad when trees are destroyed. The brochure gives no indication of the scale of the sculpture so I was astonished at how big it is when I looked at the photo on your website of you working on it. Congratulations on your exhibition and your degree!!!! Gracie…I just noticed and am totally thrilled to see I’ll be able to take in both your shows. First in Winnipeg on Saturday, the 10th and second, your show in Halifax! How exciting is that? Looks great Grace. I am sorry I can’t be at your opening as the teaching job does not leave me free to do all that I would like. I am sure you are looking foreward to the end of all the work and can bask in the results and have a break. What is happening after you complete everything? Are you returning to Winnipeg? Do you have a job offer yet? Look foreward to seeing you. Hi Grace! Very Very interesting! I love the tree ceramics. Wishing you all the best with your thesis and upcoming show!